I had dinner recently with my friend Craig, who will soon be visiting Paris for the first time. He’s a wonderful photographer and asked about ways of going beyond the usual “tourist” shots. I suggested an early-morning walk, when the streets are deserted and the light is soft. I hope my photos and custom-created tour inspire him to catch the golden hour — and I hope you’ll enjoy tagging along, too. By the way … some of these photos are 15 years old, so the quality and composition aren’t great. I hope you’ll be able to look past the flaws and see the spirit of what I was trying to capture. 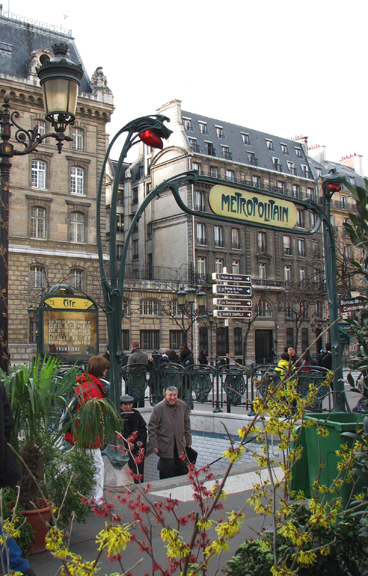 A Our tour starts at the Cité métro station. 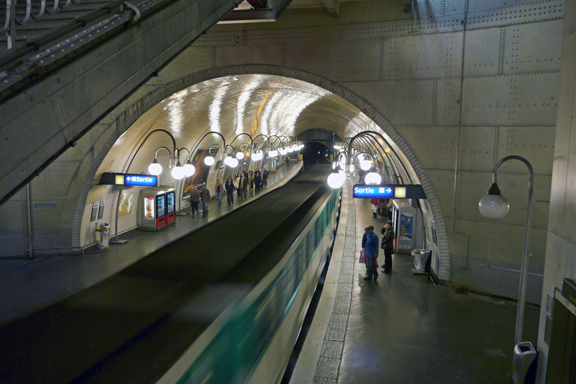 Built in the early 1900s, this station is one of the deepest in Paris. Skip the elevator and climb the three flights of stairs for a unique look at the “skeleton” of this engineering marvel. 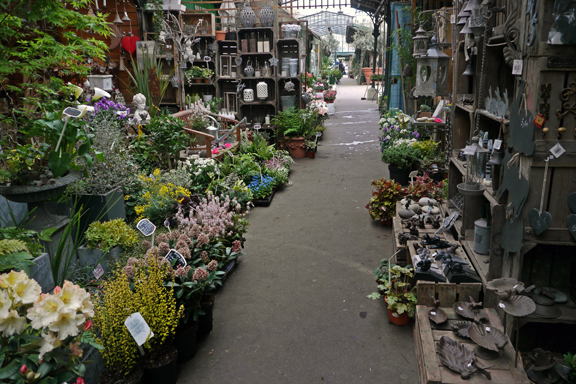 When you come out of the station, you’ll be facing the enormous flower and bird market (“le Marché aux Fleurs”), which has existed here for over 200 years. If you’re doing this tour in the morning it will likely be closed, but it’s worth coming back later in the day for a visit. Make a u-turn, so you’re facing away from the flower market. Directly in front of you will be a temporary scaffold, which conceals the renovation of the Préfécture de Police. Walk ahead and slightly to your left, onto the rue de la Cité. 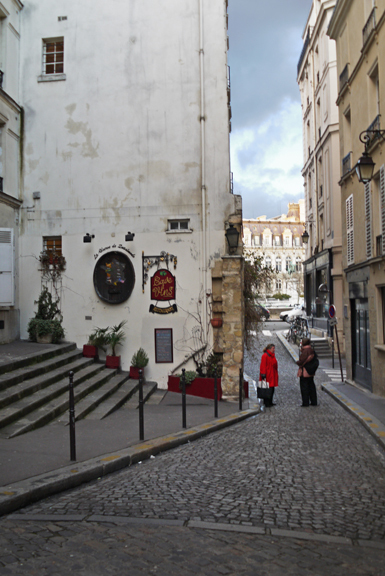 After one short block, take a left onto rue du Cloître de Notre Dame. 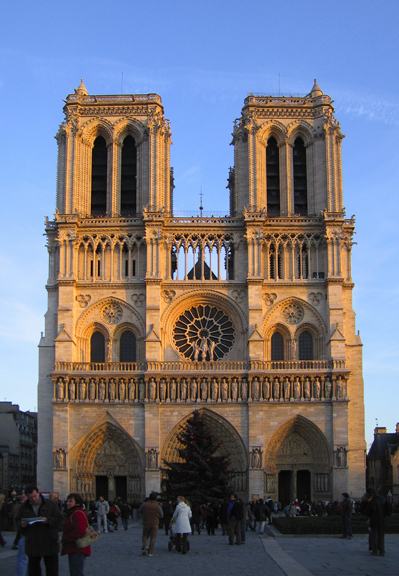 Directly ahead of you, you’ll see the beautiful Gothic masterpiece of Notre Dame — which really merits its own post. Stop, gawk, and savor the moment. You’re in Paris! In fact, I encourage you to come back to this spot again every day, because every day the light will be different. But for now, look to your left and you’ll find another impressive landmark that most tourists miss. 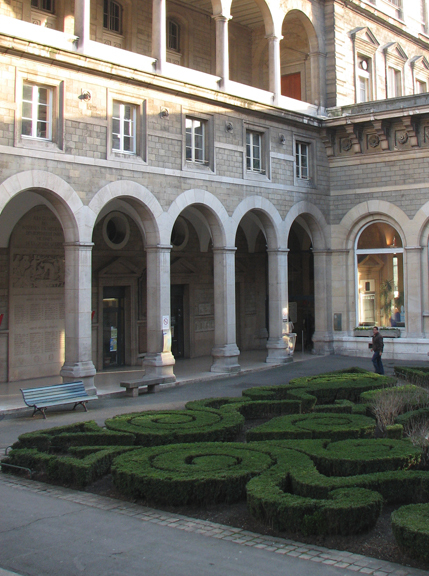 Founded in 651, the Hôpitel Hôtel-Dieu is the oldest hospital in Paris. Unfortunately much of the complex was destroyed by fire in 1771, but some vestiges of the ancient buildings remain. 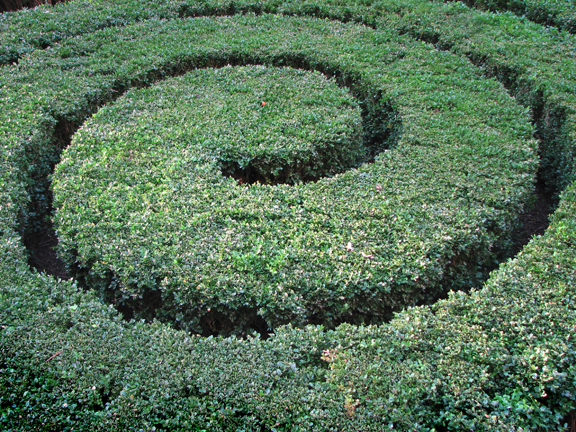 The garden in the courtyard is especially beautiful. You’re welcome to go inside during business hours and explore the grounds, if you wish. 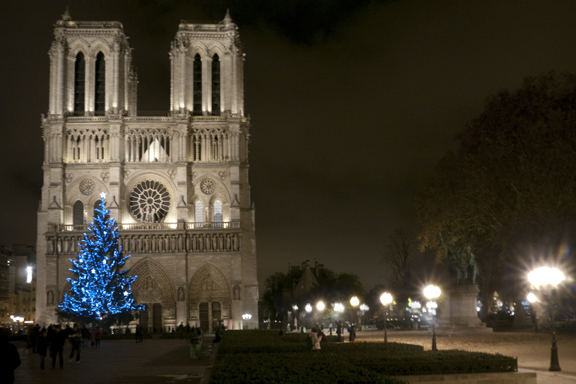 Directly in front of Notre Dame and the Hôtel-Dieu is a large, open square. 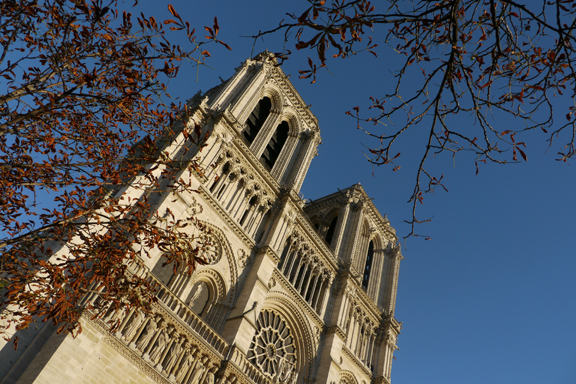 The “Parvis de Notre Dame” conceals many secrets. First up: It was smothered in rickety, ancient houses until about the 1850s, when Baron Haussmann ordered the entire area razed. 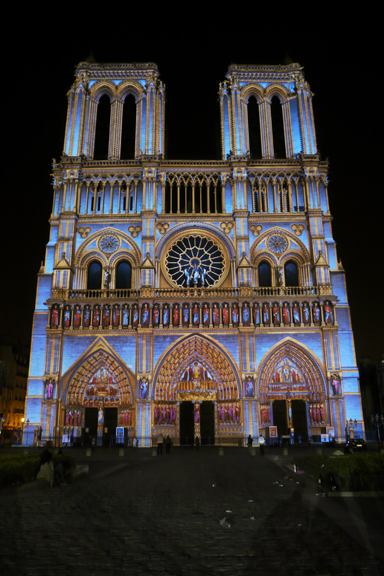 Although many people still debate Haussmann’s aggressive “urban renewal” tactics, at least no one can argue with this view of Notre Dame. Another secret of the Parvis is that the best-preserved Roman ruins in Paris lie directly beneath your feet. 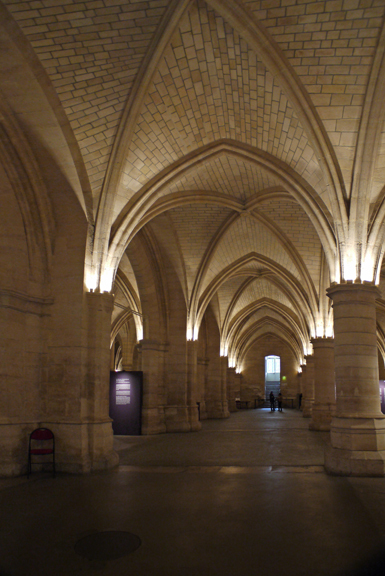 You can tour the Crypte de Notre Dame for about 7 euros (or free with a Museum Pass). If you’re a history buff, it’s well worth the investment. Finally, the Parvis houses a small brass marker that denotes “kilometer zero” in France. This is the point from which all highway-travel distances in France are measured. 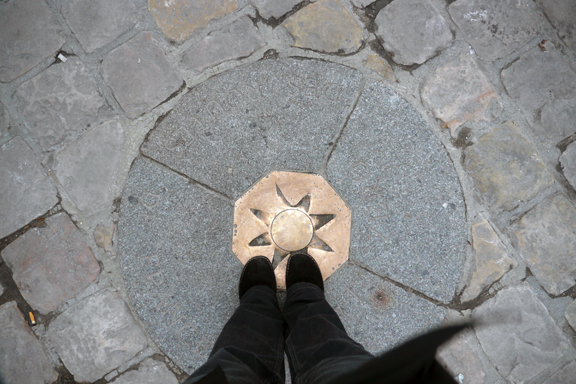 Legend has it that if you stand on this spot, you will one day return to Paris. That’s why I plant the ol’ dogs on the marker for as long as the crowds permit, every time I visit. 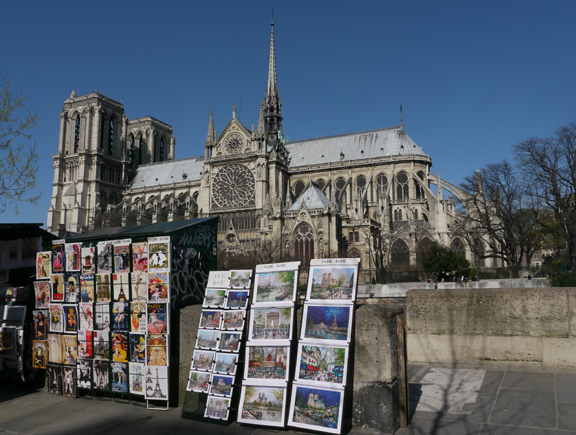 Continue walking toward Notre Dame. On your right, you’ll see an impressive bronze statue of Charlemagne. Just beyond the statue is a small pedestrian bridge. This is the Pont au Double. Take a right onto the bridge. 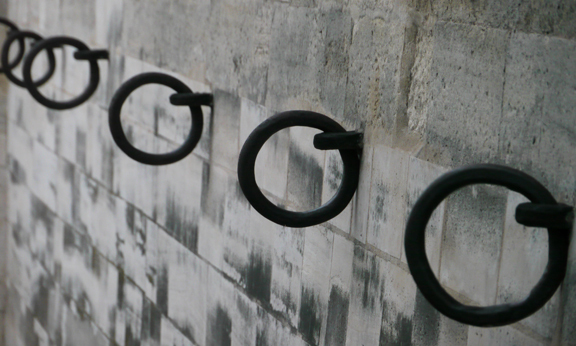 B The Pont au Double was first built in the early 1600s to give patients access to the Hôtel-Dieu hospital. 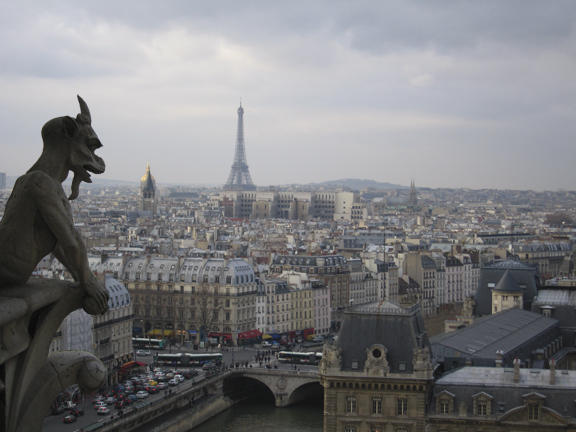 It got its name because the toll for crossing the bridge was twice as high as that for the other bridges in Paris (French taxation — and entrepreneurship — at their best!). Sadly, the original structure collapsed in 1709 and was subsequently twice rebuilt. The bridge you’re standing on today was constructed of cast iron in 1883. 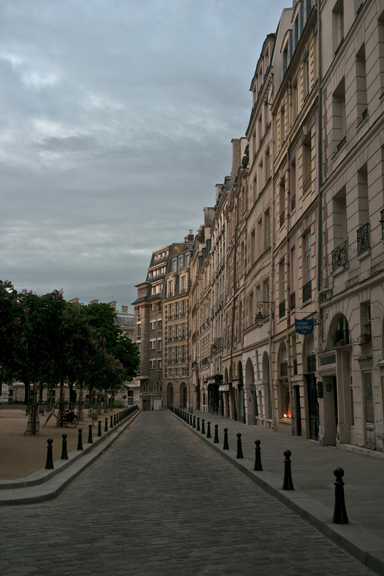 This is one of my favorite spots for early-morning photography in Paris. 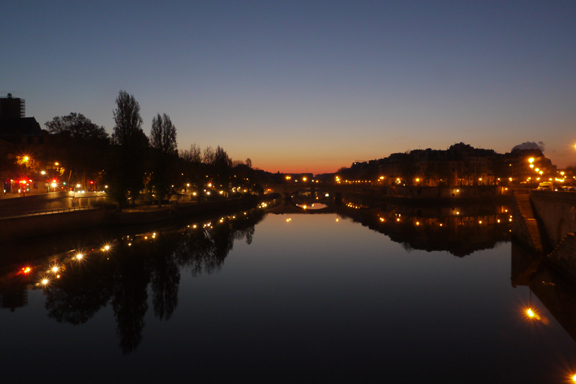 Cross the Pont au Double and take a left onto Quai de Montebello. 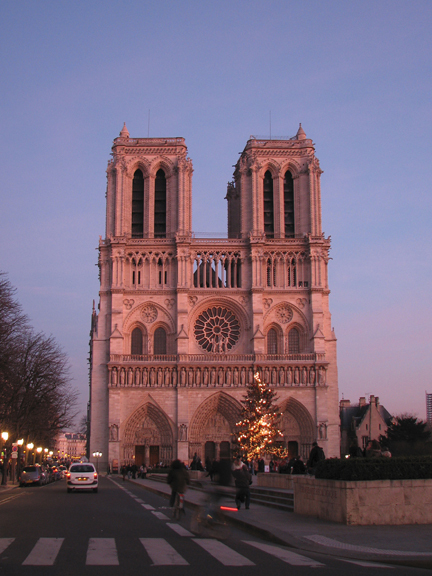 You’ll get an excellent look at Notre Dame’s southern façade, including one of her famous rose windows. 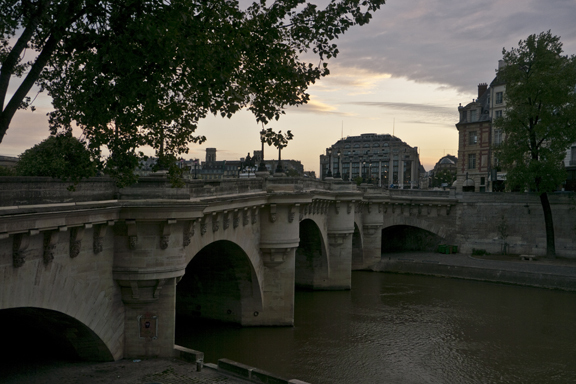 Continue along the Quai Montebello and take a left onto the next bridge you encounter, the Pont de l’Archevêché. 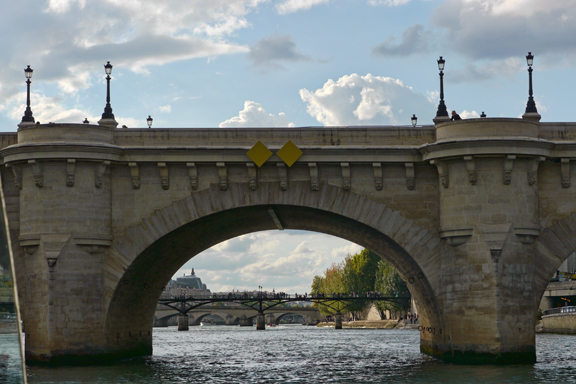 C In French, “Pont de l’Archevêché” means simply “Archbishop’s Bridge.” One of the newer spans across the Seine, this bridge dates from only 1828 and has the distinction of being the narrowest road bridge in Paris. 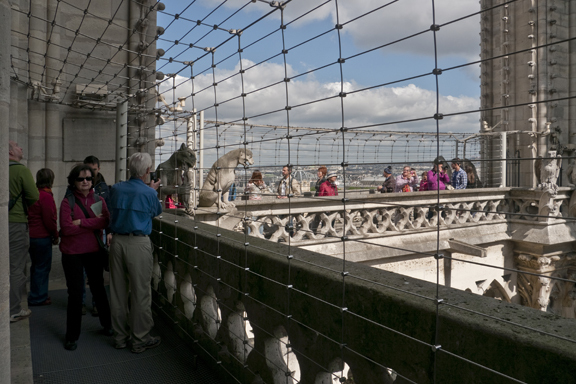 It provides a beautiful vantage point from which to shoot Notre Dame and the Seine, although in recent years the “locks of love” along its railings have become a bit of an eyesore. 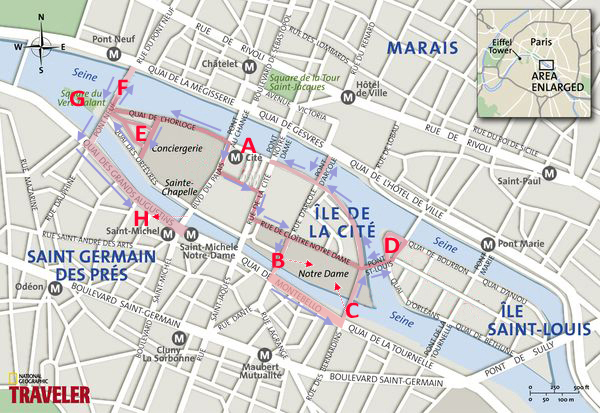 Stay on the Rue de l’Archevêché until you reach the Pont St. Louis. 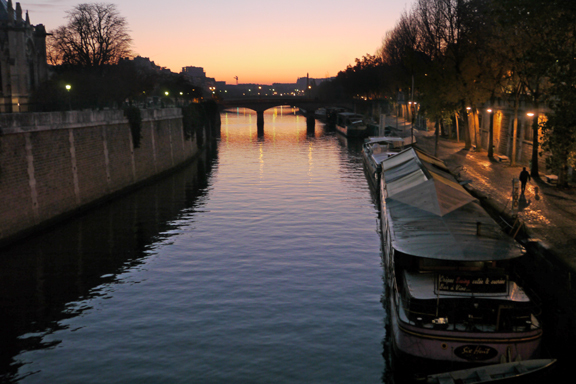 Take a right onto the bridge and cross the Seine onto the Île St. Louis. Once you’re on the island, take an immediate left onto the Quai D’Orléans, and stop at the pointed tip of the island. 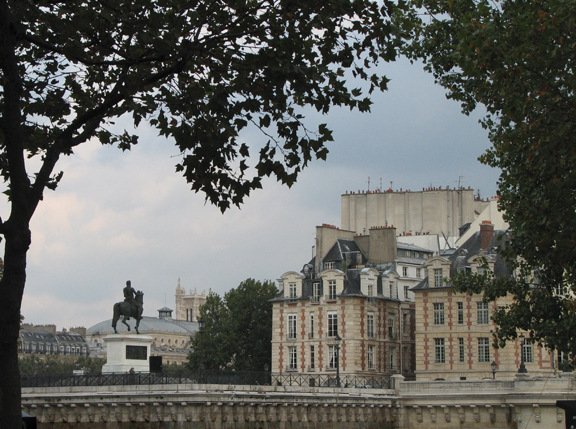 Today the Île St. Louis is considered one of the most exclusive addresses in all of Paris. 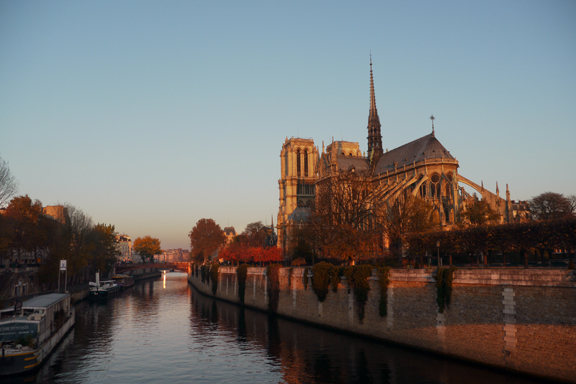 With its old streets and its gorgeous architecture, it’s worth an hour or two of exploration — but for the purposes of our early-morning walk, stop at the pointed tip of the island, where the Quai D’Orléans and the Quai de Bourbon meet. 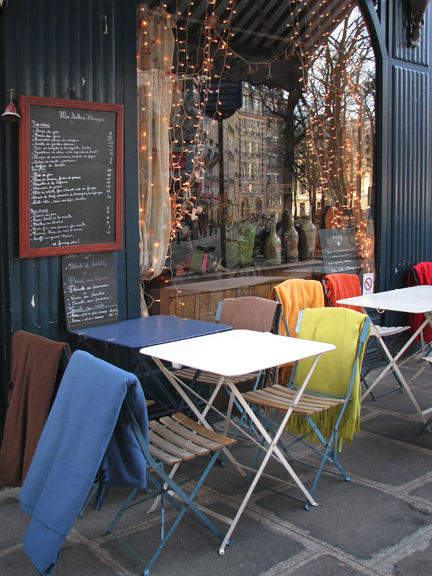 This is one of my favorite spots in all of Paris. 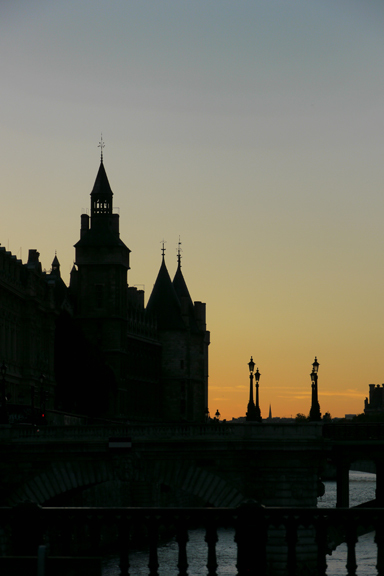 Retrace your steps to the Pont St. Louis and cross the Seine River again. 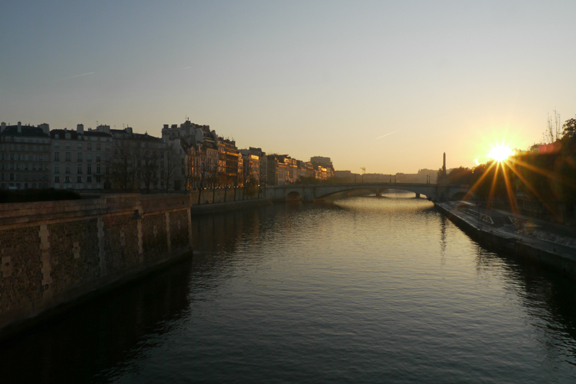 But this time, take a right onto the Quai aux Fleurs. 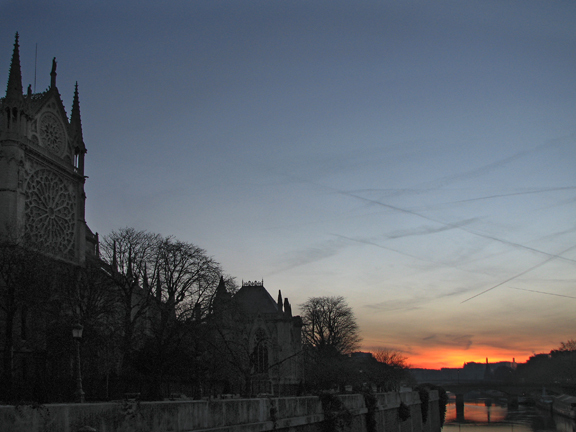 The “quais” that line the Seine are manmade embankments, buttresses against the river’s unpredictable flooding. 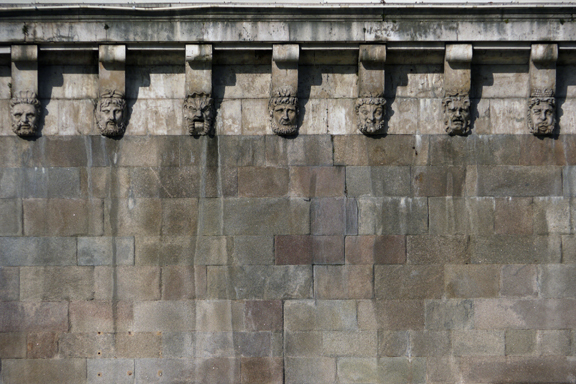 Indeed, these tall walls have preserved some of Paris’ greatest historical and architectural treasures. 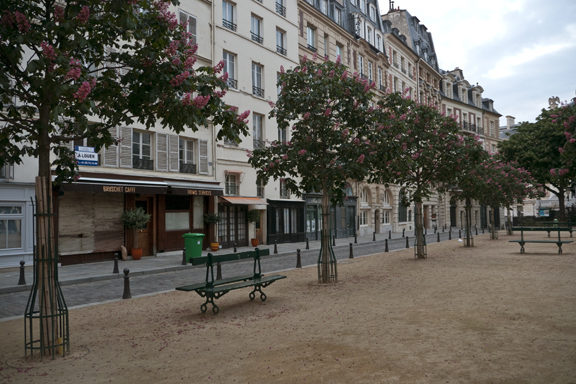 For example, at 9 – 11 Quai aux Fleurs is the site where Héloïse and Abelard reportedly first met and fell in love. You’ll also walk parallel to the beautiful rue des Ursins. Although the narrow “ruelle” is faithful to its medieval origins, the ancient-looking house is actually quite modern: The structure was built in the 1800s, purchased in the 1950s by the oil baron Aga Khan, and redesigned “à la moyen age” in 1959. Still, it’s one of my favorite little streets in Paris. 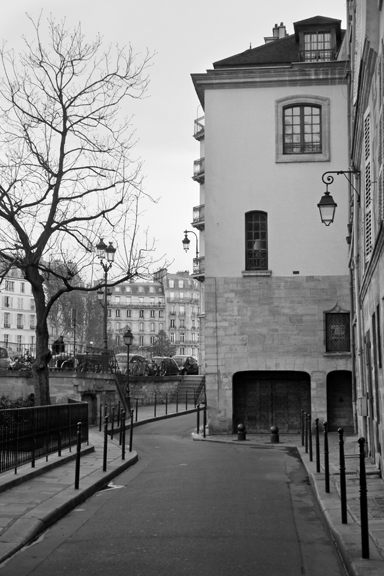 Note how the Rue de la Colombe slopes down as it approaches the Seine and then rises up to meet the Quai aux Fleurs. 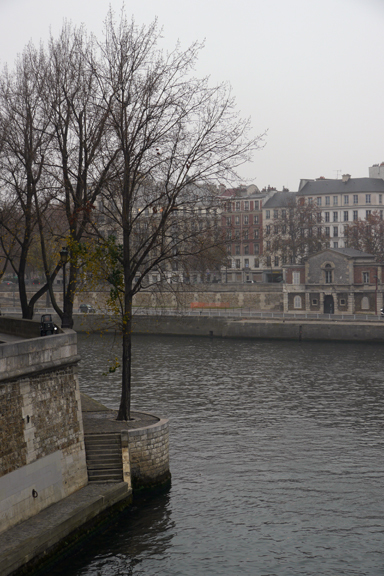 The quai was built in 1804 to protect the island from frequent flooding. 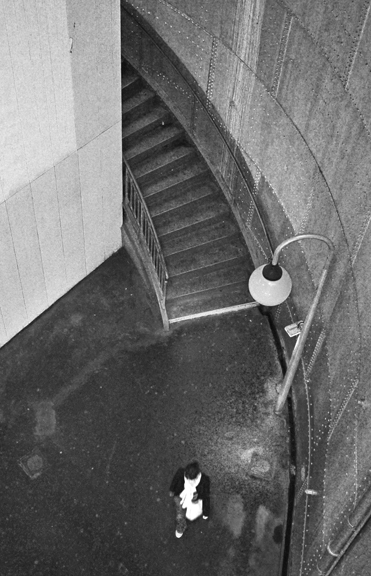 Before it was in place, Rue de la Colombe descended straight down to the water. In fact, continue the slope of the street in your mind’s eye and see it meet the water. This is the only place along the river in Paris where you can see the original shape of the land going back thousands of years. This is truly historic Paris. Take a left and walk one block up this street if you want to see for yourself. 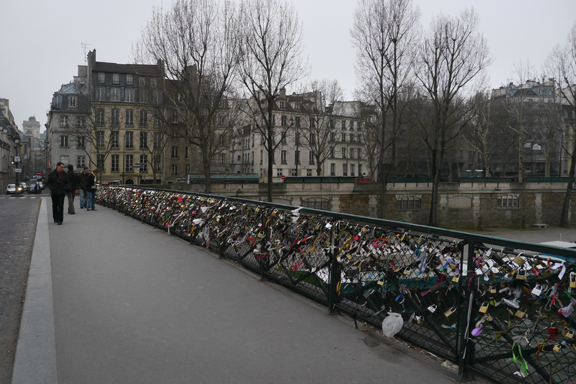 Continue along the Quai aux Fleurs until you reach the Pont D’Arcole. Take a right onto the bridge. The Pont D’Arcole was pretty state-of-the-art when it was built in 1928 — a good thing, because 16 years later it carried the tanks of Général Leclerc’s 2nd Armored Division when they rolled in to liberate Paris from the Nazis. 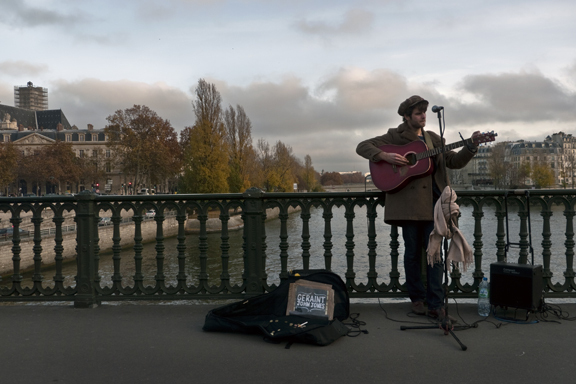 But these days I love the Pont D’Arcole because it’s one of the best places to catch some great shots of the sunrise in the morning — and to hear some of the city’s best buskers in the afternoons and evenings. If you see my friends Rudy McLeod and Geraint John Jones, please tell them I say hello. 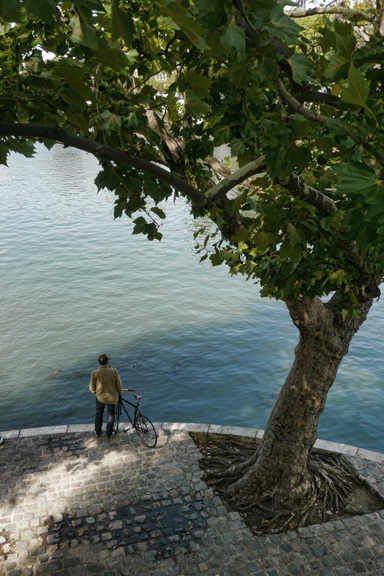 Retrace your steps back across the Pont D’Arcole and take a right onto the Quai de la Corse. 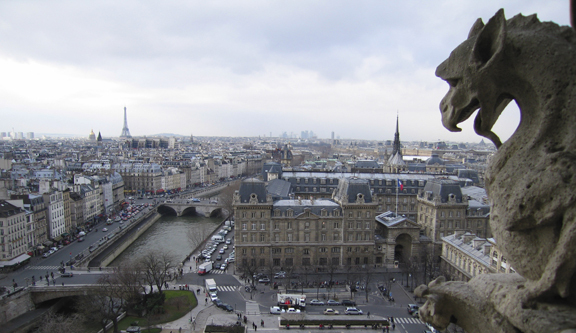 You’ll pass two bridges on your right — the Pont Notre Dame and the Point au Change — before the street name changes to Quai de L’Horloge. Directly to your left you’ll see the Conciergerie and its imposing turrets. This enormous complex started out as a palace in the 10th century, as is evidenced by the impressive Gothic vaults in its cellar. You can tour the room where Marie Antoinette was held if you’re so inclined, as well as the tiny courtyards where another 2,700 others drew their last breaths as they awaited their dates with Madame Guillotine. Entrance is free with a Museum Pass. Keep walking along the Quai de L’Horloge. 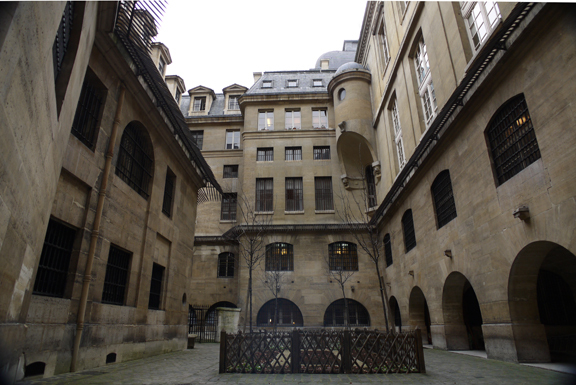 After you pass the entire Conciergerie complex, take a left onto rue D’Harlay. 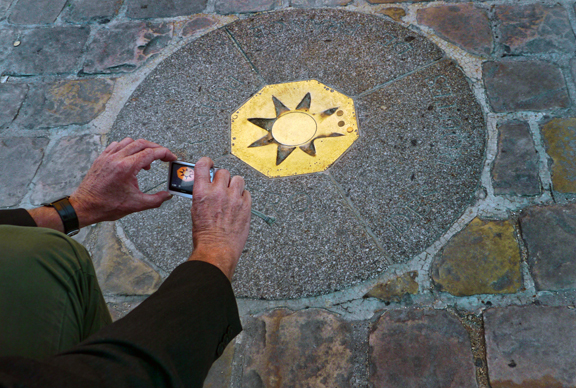 E You are now in the Place Dauphine, Paris’ second-oldest public square. 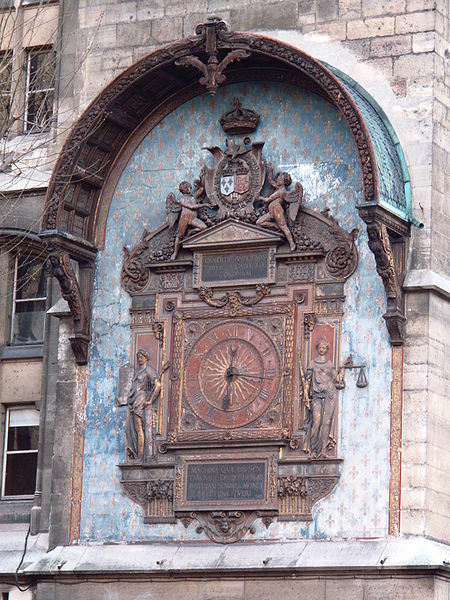 King Henry IV established this site in 1606 and named it after his son, le Dauphin de France. As was the case with the Île St. Louis, this section of the island was once made up of marshy islets, which were consolidated with gravel and fill. 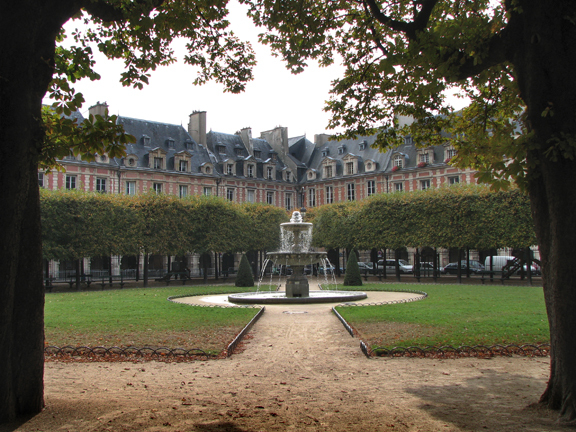 The houses that line the Place Dauphine were completed in 1616, and were strikingly similar to those that still flank the Place des Vosges (Paris’ first and oldest public square — seen below, but sadly, not on this tour). 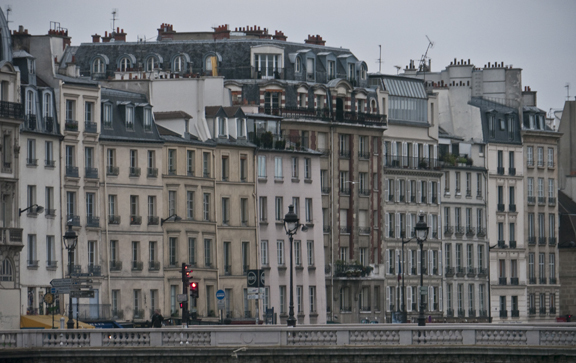 However, most of the buildings in the Place Dauphine have long since been remodeled, and today only two retain their original appearance: those that face the Pont Neuf. 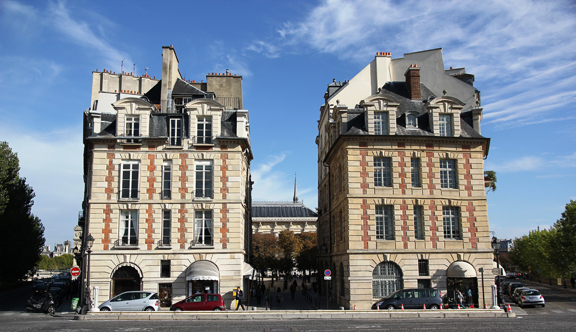 Walk between these two buildings as you exit the Place Dauphine via Rue Henri-Robert. 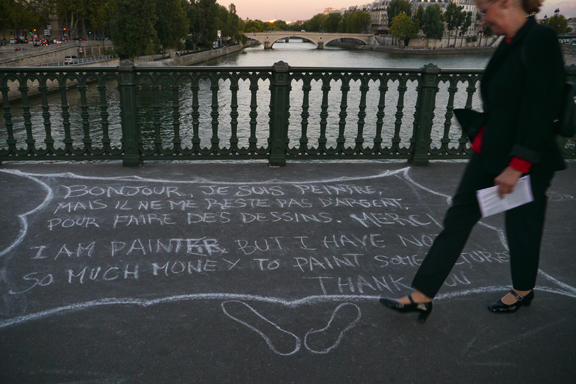 Carefully cross the street onto the Pont Neuf. F In French, “Pont Neuf” means “new bridge.” But ironically, the bridge you are now standing on is the oldest surviving in Paris. 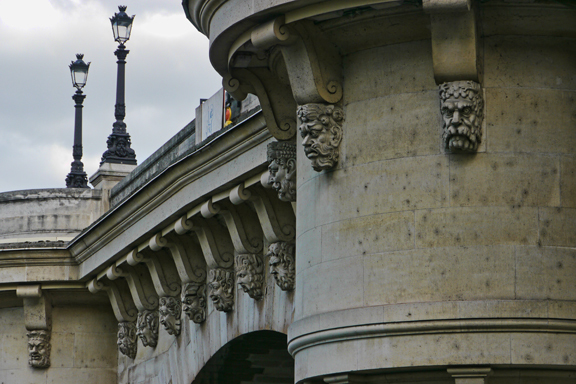 Construction of this beautiful stone span began in 1579, but it wasn’t completed until 1607. 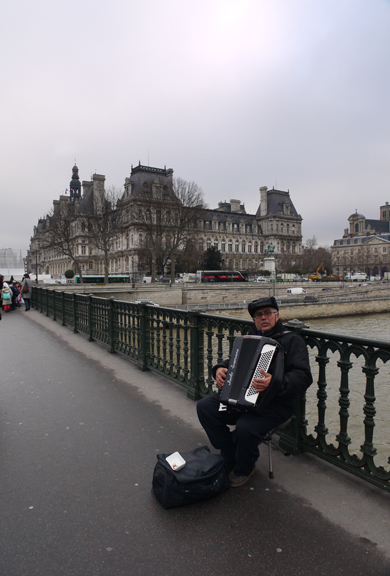 The Pont Neuf is unique in Paris for several reasons. 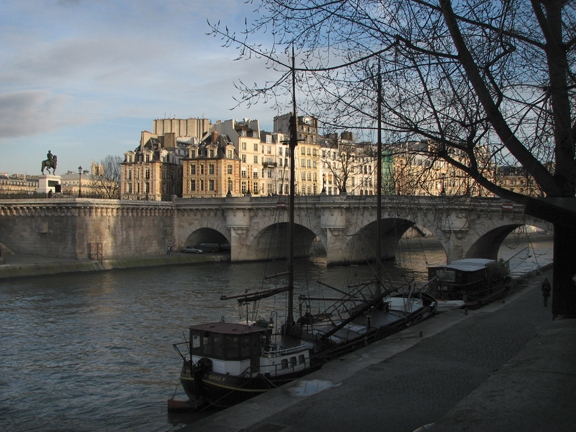 First, it’s the only bridge that spans both banks of the Île de la Cité (seven arches reach to the right bank, while another span of five arches connects with the left bank). 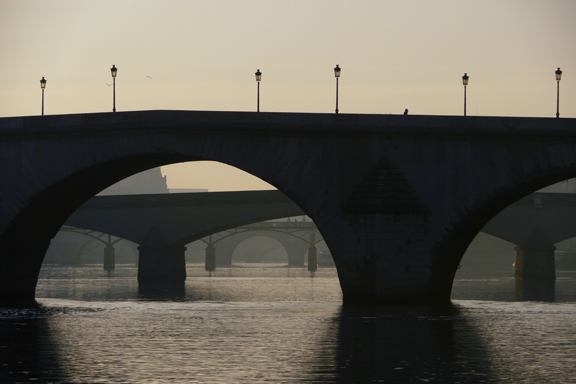 The Pont Neuf was also the first bridge in Paris to be built without houses on it — and for a long time it was the widest bridge, as well. 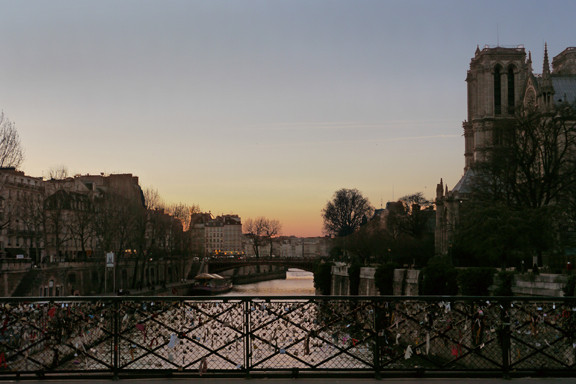 The Parisians went crazy for this new open-air concept, and the Pont Neuf became a popular spot for socializing and entertainment. 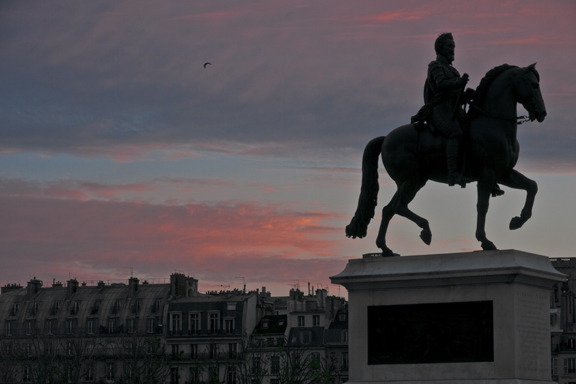 Before continuing, check out the imposing statue of Henry IV on horseback in the middle of the bridge. The original bronze statue was knocked over and melted down in 1792 during the French Revolution, but was replaced in 1818 with this exact replica. G Stand on the Pont Neuf and face west, toward the Eiffel Tower. 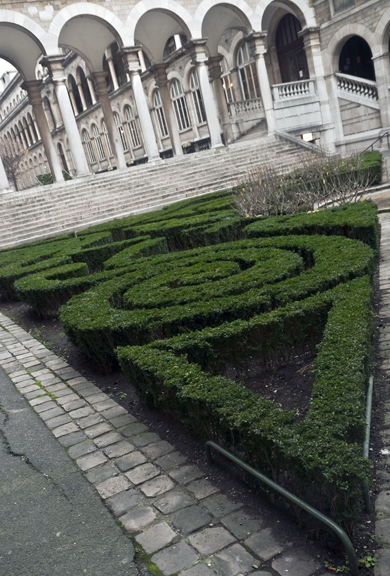 If you look down you’ll see a triangle-shaped park, the Square du Vert Gallant. The name translates roughly as “park of the lusty gallant,” a nod to Henry IV’s virile reputation. If you have time, I recommend walking southwest on the bridge and taking a left onto the Quai des Grands Augustins, on the left bank. 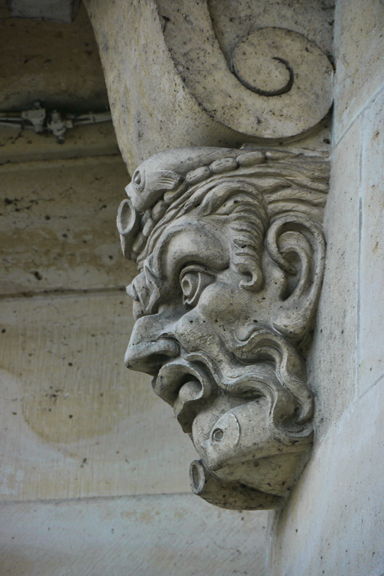 If you take the stairs down to the river’s edge and walk parallel to the Quai des Augustins, you’ll be rewarded with a closer look at the “mascarons” that dot the Pont Neuf. There are 384 of these sculpted masks, in total — and every one of them is unique. 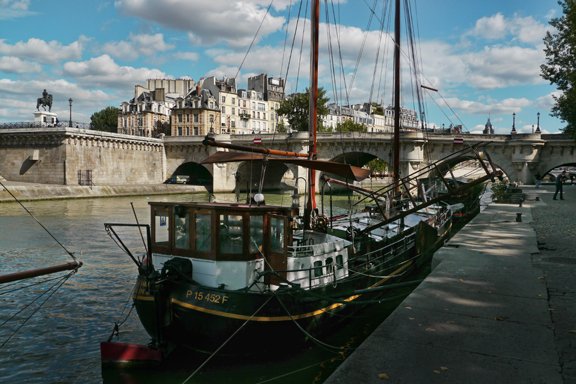 … and a few vestiges of the critical commercial role the Seine once played in Paris. 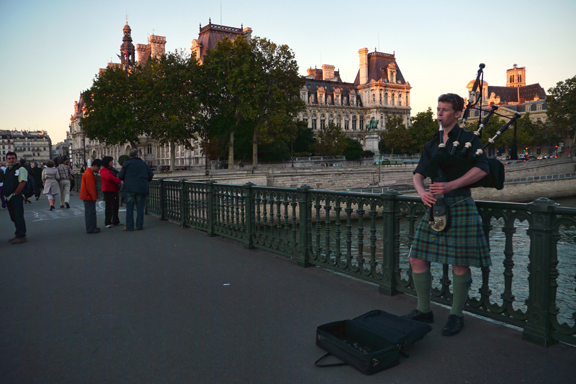 Just a few blocks later you’ll come to the Pont St. Michel. Walk halfway across this small bridge and face southwest. 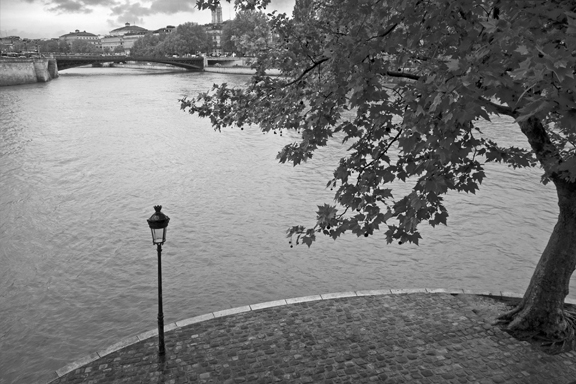 H From the Pont St. Michel, you can enjoy one last look at quintessential Paris. I hope you’ve enjoyed your virtual tour, Craig. I can hardly wait to hear your own impressions of this beautiful city — and, of course, see your images. Bon voyage! Previous Why are Americans so … ? Thanks for the shout-outs. What a generous and thoughtful gift for your friend; well done indeed. I don’t even know Craig but I’m excited for him (and a bit jealous) that he’ll get to discover Paris for the first time! This post really whets my appetite for September when you’ll be back in town! 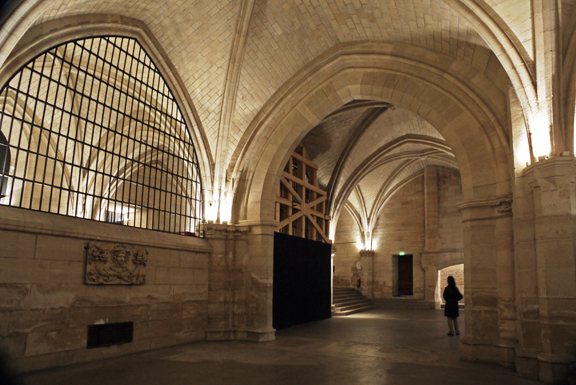 Thanks, too for the update on the Conciergerie … I was wondering how the renovation was coming along. And I especially liked your comment that now it looks perhaps *too* clean. 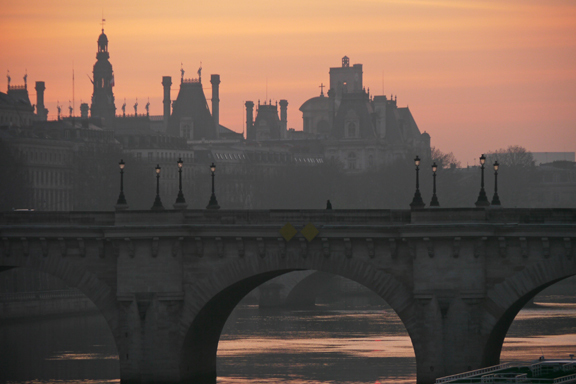 Don’t worry; in another year or two of Paris’ smog, it’ll look good as old again. Ha. In any case, I can’t wait to see you in September. I’ll bring along my goonie map, too, and we can compare notes. Til then, prends soin de toi! so beautiful. it’s been five years since i’ve been to paris. i can’t wait much longer.